Swimming in New Hampshire ranges from doing the crawl through ocean waves off the state's beaches on the Atlantic to gliding through the clear fresh waters of a lake, river, or pond to the north and west. Plenty of state and local parks have beaches and swimming facilities. Where some family members like to go swimming, others may enjoy fishing at many locations with convenient boat ramps. Get your lodging near the water! Come to Purity Spring Resort for the mountain and lakeside scenery and the swimming. You’ll find two tantalizing options starting with pristine and sparkling Purity Lake. A spring-fed natural body of water, the 75 acre Lake stretches out from one end of the resort to the other. Enjoy 5 sandy beaches, grassy areas to r spread out on, plus a playground for the kids. 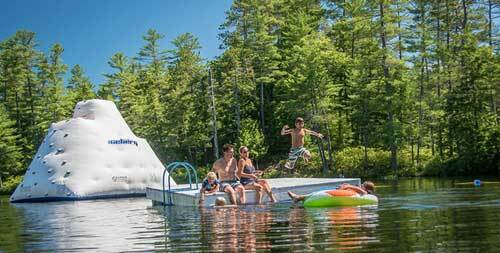 The swimming area includes a floating dock, and the “Purity Iceberg”, a 25 foot climbing wall and slide combo. Or take a dip in the 50-foot indoor pool at The Mill Fitness Center where you can also relax in the hot tub. A lounge area offers plenty of comfortable seating for reading, sleeping and slowing down.